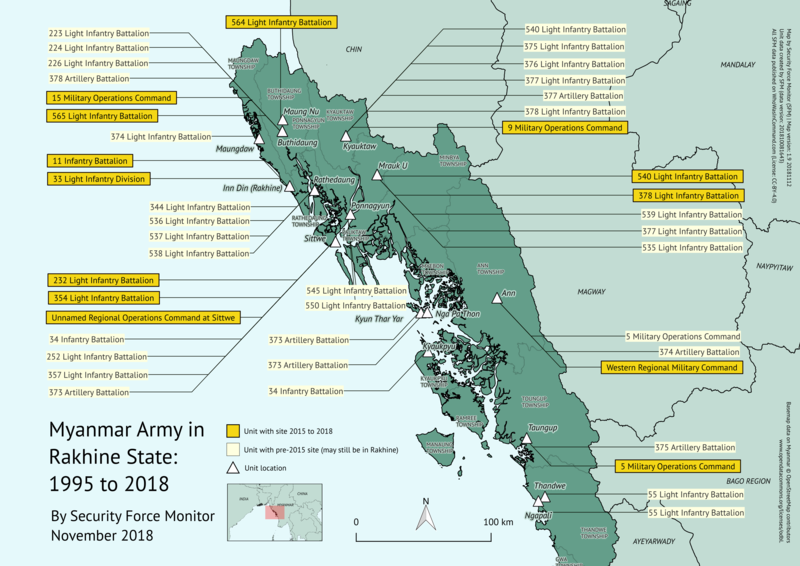 Myanmar Army in Rakhine State: 1995 to 2018 – a map by Security Force Monitor (CC-BY-4.0) (Click here to open a high resolution version of this map). Over 300 public documents reviewed by Security Force Monitor evidence the existence and chain of command of 554 distinct units and 111 command personnel of the Myanmar Army going back to 1947. At least 56 units can be placed in Myanmar’s Rakhine State from 1995 onwards, and 28 of these can be placed there between 2015 and 2018, a period during which the Myanmar Army and other security forces stand accused of killing thousands of Rohingya Muslims and causing the flight of an estimated 700,000 more to neighboring Bangladesh. The United Nations human rights expert on Myanmar has stated that Myanmar security force operations in 2016 and 2017 “bear the hallmarks of genocide” and Amnesty International has repeatedly called for accountability for an “explosion of violence” against Myanmar’s Rohingya population that it alleges amount to crimes against humanity. Which units of the Myanmar Army have bases, camps or other sites in Rakhine State? Where have units of the Myanmar Army operated in Rakhine State? What is the Myanmar Army chain of command in Rakhine State? Our hope is that our research will prove valuable to those examining the conduct of the Myanmar Army, and that they find in our work a useful framework for unpicking the chain of command of the one of the world’s most secretive armed forces. For readability, we have not included references to all of our sources within the article text. Instead, we have published all of these on our platform WhoWasInCommand.com, along with all the data underpinning our analysis. At the end of the article we also provide a list of all of the units we mention, linking to their full profiles on WhoWasInCommand.com. At Security Force Monitor we create structured data about police, military and other security forces and their commanders. We publish all of this data for free online (on WhoWasInCommand.com) for human rights researchers, investigative journalists and litigators to use. We create simple data visualizations of organizational structures, physical locations and the areas of operation of specific units of the security forces of a country. The data we create provides leads and linking information that helps investigators identify the names of specific units, personnel and their superiors thought to be responsible for the commission of human rights abuses. We conduct our research by extracting data from public – mostly online – sources like news articles, as well as reports from NGOs, governments and international bodies. Every single datapoint we create is evidenced by one or more sources. You can find the sources for every single datapoint they evidence on WhoWasInCommand.com. Every datapoint is also time-bound. This means we specify the earliest and latest point in time that our sources can evidence a datapoint. In our Research Handbook we describe fully our research approach, our data model and what it means, and provide some tips on how to use WhoWasInCommand.com. “Unit”: a distinct part of the hierarchy of a security force. Units can range from a national defense ministry to a police post in a small town. We collect up to 40 types of data about units, all of which are described here. “Parent unit”: the immediate superior unit in the overall hierarchy. Parent units have hierarchical, time-bound relationship with the unit(s) below them. The parent is “above” or distinct and separate from the unit in some way. Over time, a unit may have different parents (or even more than one parent at the same time). The Research Handbook contains more information about parent units. “Unnamed unit”: although we know a particular unit in a security force hierarchy exists, we are sometimes unable to find sources that evidence its exact name. A good example from Myanmar is sources tell us there is a Regional Operations Command based in the city of Sittwe, but do not give the unit a proper name (such as the Kachin State based “2 Regional Operations Command”). We have labelled it “Unnamed Regional Operations Command at Sittwe” until we discover a source with a proper name for the unit. We provide information on this concept here in the Research Handbook. “Sites”: a specific place where a source says a unit was or is located. Sites can be everything from a major military base to a small outpost or checkpoint. Sites are usually a generalized location, such as the center of a town, for example, rather than precise coordinates. More information on sites can be found here. “Area of operations”: a geographical area in which a unit conducts any sort of activity. In general, we map areas of operation onto the administrative geography of a country. Based on the country’s administrative geography the smallest area of operations a unit can be assigned in Myanmar is a “township”, followed by “district” and then a “state” or “division”. More information on areas of operation can be found here. 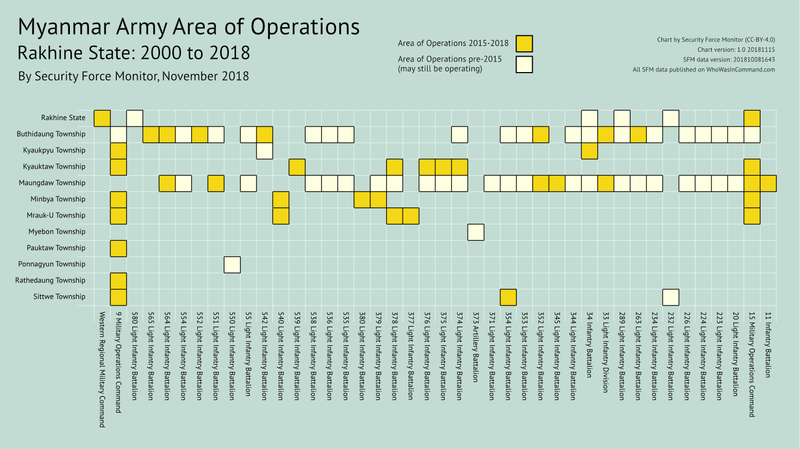 Units highlighted with deep yellow box have sites and/or areas of operation in Rakhine State at some point between 2015 and 2018. This clearly places them into the scope of investigations into war crimes and crimes against humanity allegedly committed by Myanmar security forces in Rakhine State in 2016 and 2017. Units highlighted in a cream box have sites and/or areas of operation in Rakhine State at any point before 2015 and may still be based and/or operating there. This does not exclude them from the scope of investigation – it indicates that the sources we have analyzed so far do not place them in Rakhine State past 2015. No sources we have reviewed to date indicate any units in this analysis ceased to operate or be based in Rakhine State. Which units of the Myanmar Army have sites in Rakhine? We can document the pattern of deployment of a security force using a combination of “sites” and “areas of operation”. As earlier noted, we define sites as named locations at which a unit has physical infrastructure like bases, offices, camp or checkpoints. The deployment of the Myanmar Army in Rakhine State was obviously more complex than a simple map can easily show. During this timeframe new units were created, and Rakhine-based units were deployed to other areas of the country (including Shan State and Kachin State, where NGOs have also alleged the military committed human rights abuses). There were also deployments of units from other states or divisions to Rakhine State, and units also circulated within the state. The evidencing we have for these sites is of variable quality. While we have managed to robustly source some sites, for others we found only a few sources or a single source. Sometimes the sources we did find did not indicate whether the unit continued to be based in Rakhine State or not. Since sources were not explicit about whether any of these units permanently moved from Rakhine State we have chosen to include them all in the map above. Which units of the Myanmar Army have operated in Rakhine State? Areas of operation are another component of a security force’s geographic footprint. We define an area of operation as a geographical area where a unit has carried out any sort of activity. As with sites, a deep yellow box denotes that the unit had an area of operations in Rakhine State at some point from 2015 onwards. A cream highlighting box shows that the unit was operating in Rakhine State at any point before 2015 in Rakhine State, but may still be operating there (as no source indicates any of these units ceased operating in Rakhine). The concentration of units operating in the townships of Buthidaung and Maungdaw is very clear from this analysis. The heatmap above does not show data concerning six of Rakhine’s 14 townships, as well as its five districts. This is because the sources we examined did not explicitly state any unit conducted operations in those townships or districts. Some units, like the Western Regional Military Command, have sources that give it an area of operations of the entire state of Rakhine. For others the sources for their area of operations did not identify a specific area within Rakhine State where they were operating, and thus we only gave them a more general area of operations across all of Rakhine State. We may refine this in a later analysis, if more sources emerge. Finally, this heatmap includes nine units which did not appear on the map of sites. This is because the sources evidence areas of operation, and not sites, in Rakhine State. The nine missing units are: 20 Light Infantry Battalion, 234 Light Infantry Battalion, 289 Light Infantry Battalion, 371 Light Infantry Battalion, 379 Light Infantry Battalion, 380 Light Infantry Battalion, 551 Light Infantry Battalion, 554 Light Infantry Battalion, and 580 Light Infantry Battalion. 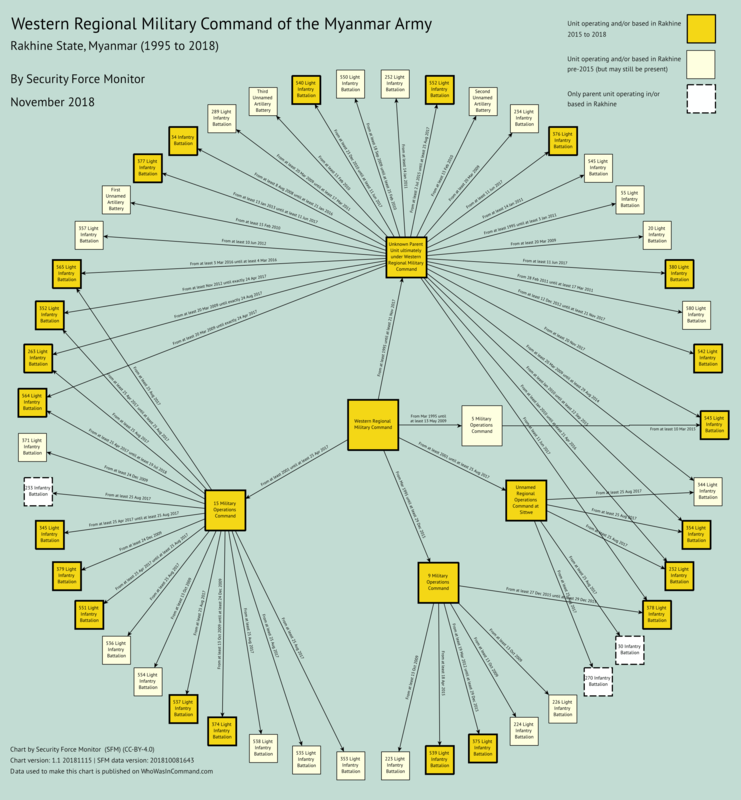 What is the chain of command of the Myanmar Army in Rakhine State? In the sections above we mapped out the sites and areas of operation – together, the geographic footprint – of the Myanmar Army in Rakhine State. We will now explore how the different units relate to each other and visualize the organizational structure, and the chain of command. Our focus will be on the Western Regional Military Command and its subordinate units. Units which have alternative chains of command: the 33 Light Infantry Division (and its subordinate the 11 Infantry Battalion) as well as artillery battalions, will be explored in a separate analysis. 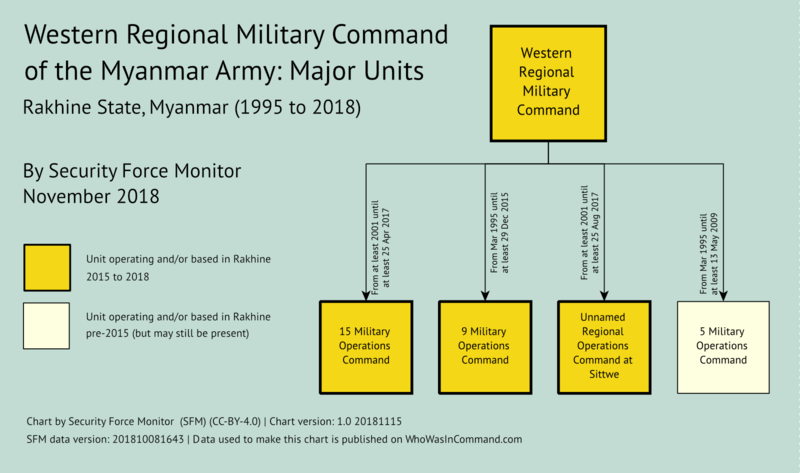 As the name suggests, Regional Military Commands (RMCs) in the Myanmar Army command army units in the areas they oversee. The Western RMC has commanded units in Rakhine State (as well as neighboring Chin State) since at least 2000. Subordinate to the Western RMC (which can command battalions directly) are three Military Operations Commands (which generally command ten battalions) and a Regional Operations Command (which generally command four battalions) in the Rakhine capital of Sittwe. The chart below captures this top level command structure. The sources we analyzed generally support the claim that an infantry battalion or light infantry battalion (the smallest trackable units of the Myanmar Army) with a site or area of operations in Rakhine State should fall under the Western RMC. We are, however, often unable find a source identifying their specific parent unit: it could be one of the three Military Operations Commands, the Regional Operations Command or even the Western RMC itself. In order to accurately show this gap in our sourcing, as well as connect these units to the wider chain of command, we have created a “placeholder” unit appropriately dubbed “Unknown Parent Unit ultimately under Western Regional Military Command”. With this placeholder the 564 Light Infantry Battalion, for example, can be connected to the wider chain of command from at least 20 March 2009 (when the unit was first deployed to Rakhine State) up until 25 April 2017, when we finally have a source giving the battalion a specific parent, the 15 Military Operations Command. We’ve included the duration of command relationships between units as a label on the arrow linking units. As with all of the charts in this article we color code units based on their deployment pattern (a combination of site and/or area of operations) in Rakhine State. A deep yellow box means the unit has at least one geographic datapoint (site or area of operations) in Rakhine State at some point between 2015 and 2018. Units in a cream box have sites and/or were operating in Rakhine State at any point before 2015 in Rakhine State, but may still be based and/or operating there. Units which only have sources for a pre-2015 location and/or area of operations in Rakhine State, for example the 536 Light Infantry Battalion, will be in a cream box even if they have a command relationship at some point between 2015 and 2018. For this chart, we have added third category: the 233 Infantry Battalion, 270 Infantry Battalion and 30 Infantry Battalion are all in a dashed white box . This indicates that the sources available to us give assign them a parent unit which is based in Rakhine State. Although we do not have any sources which give these units a site or an area of operations in Rakhine State, the presence of their parent units makes it more likely than not that those battalions are also based and/or operating in Rakhine State. As a final note, units that were/are only based or operating in Chin State have been excluded from this analysis. While the Western RMC also oversees Chin State, we focus on Rakhine State for this piece. How complete is our data? As noted above, we have collected data on 554 units of the Myanmar Army. All of this data is published on WhoWasInCommand.com. We have assembled our data on Myanmar from roughly 300 sources. These include reportage predominantly from The Irrawaddy and news aggregated by Burma News International. We sourced the overall organizational and command structure of the Myanmar Army from two books: Building the Tatmadaw: Myanmar armed forces since 1948 (2009) and Burma’s armed forces: power without glory (2002). The pervasive secrecy of the Myanmar Army makes it difficult to truly gauge the completeness of our dataset. However, the book Burma’s armed forces: power without glory (2002) gives a count of units of the Myanmar Army on pages 298 and 299. Of the 528 battalions of all types referenced in Burma’s armed forces we have data on roughly 74% battalions of the Myanmar Army (394 out of 528). This includes 95% of all Light Infantry Battalions (253 out of 266), 65% of all Infantry Battalions (112 out of 171), and 60% of all Artillery Battalions (26 out of 43). Several support battalions (mechanical and signals battalions) are also in our dataset. In 2009 a source stated there were over 50 infantry or light infantry battalions in Rakhine State. We currently publish data on 44 infantry or light infantry battalions based or operating in Rakhine State, or under the command of Rakhine State based units of the Myanmar Army. A combination of sources indicates that we appear to have complete coverage of all units in Rakhine State which are above the level of a battalion and subordinate to the Western RMC. As we explain in our WhoWasInCommand.com country summary for Myanmar, there are still many areas that need further research. This analysis represents our best understanding of the Myanmar Army in Rakhine State and the Western RMC, based on sources available to us as of November 2018. If there are additional public sources which should be included in our dataset, please let us know. As a final note, we will be writing more about how our Myanmar data connected to the Report of the detailed findings of the Independent International Fact-Finding Mission on Myanmar.